As India is witnessing rapid economic transitions under a young demographic backdrop, the administrative systems are also witnessing a period of dynamic transition as Information Technology is improving last mile delivery and the efforts to catalyse Cooperative Federalism have been initiated through the Niti Aayog. It is evident that for the country to realise its vision of social and economic inclusion, we will have to streamline how both public and private institutions interact in a fast growing economy. Theoretically, the concept of Institutional innovation redefines roles and relationships across independent entities to accelerate and amplify learning and reduce risks, but it also creates the paradox of embedded agency. While a rigid institutional framework ensures operational integrity and service delivery for organisations, the same rigidity makes it difficult for these institutions to respond and adapt to external changes (Rongdong Chen, 2011). In the context of our governance system, Institutional innovation refers to the ability of our governance framework to not only adapt to external changes, but also enforce ‘disruptive’ mechanisms and technologies that alleviate the policy implementation bottlenecks arising out of the Centre-State interface and the mechanisms. A recent example of this behavior can be observed in Direct Benefit Transfer for LPG (DBTL) Scheme, where Aadhar Card was used as the disruptive technology to converge the Government Subsidy with Oil & Gas Companies and Banks to improve last mile delivery of gas subsidies. Acute innovations tend to occur quickly; they are dominated by individuals who are close to the locus of decision-making whereas incubated innovations take place slowly, frequently over many years. While the former, being more top driven, faces less partisan conflict, the latter is susceptible to be caught up in the partisan politics of multi stakeholder dynamics (William A. Galston, 2015). It is no secret that improving our implementation framework will go a long way in realising our socio-economic goals. Without cooperation between the state and central machinery, or even institutions, departments and ministries under their respective jurisdiction, there will always be a dichotomy between planning and implementation. However, the emergence of new digital infrastructures and a global liberalisation of economic policy have impacted the manner and efficacy of national and regional systems of innovation (Ryan Raffaelli). Institutional innovation has the ability to restructure the fundamental influences of the national education system, industrial relations, technical and scientific institutions, government policies, cultural traditions and many other national institutions. In recent times, digital technology has demonstrated disruptions in this established order that can shift institutional arrangements, power structures, relational interactions, and well-honed practices. The last concept of network governance aims to empower the on-ground institution to effectively link up with the policy and create a pool of ‘resource institutions’ that are reflexive towards localized solutions. In the past, ‘Institutional Reforms’ have struggled to come to grips with a fast changing society, mind-boggling innovations in technology and business practices, and growing public impatience (Pianin, 2015). Institutional innovation is an evolution of these reforms which aims to ensure implementation by making reforms more adaptive to external changes by negating the isolative environment which bureaucratic processes often tend to create. To quote an example here, Seoul’s innovation Bureau is engaging citizens to re-design and re-imagine public services. Seoul is dedicated to becoming a Sharing City; including Tool Kit Centers where citizens can borrow machinery they would rarely use that would also benefit the whole community. This approach puts citizens at not only the ‘center’, but the ‘control center’ of their communities, leveraging participatory governance (Gilman, 2014). The Green Revolution in the 1960s and the IT Revolution at the turn of the millennium have demonstrated that institutional innovations can have long term positive impacts upon the economy. However, we need more pragmatism to plug in the Policy-Innovation performance gap. According to The Global Innovation Index 2014, India has actually shown a decline trend which continued on the distress mode even after the global economic crisis. However, with a new, dynamic government in place that is riding on the slogan of ‘minimum government, maximum governance’, and an optimistic startup environment, a brighter future for the Indian economy is on the horizon. The nation is experiencing a ‘creative awakening’, and institutional innovation will go a long way in fostering the spirit of ‘Young India’. Institutional innovation at the grassroots is an asset that can’t be ignored as we move ahead into the next era of economic growth. 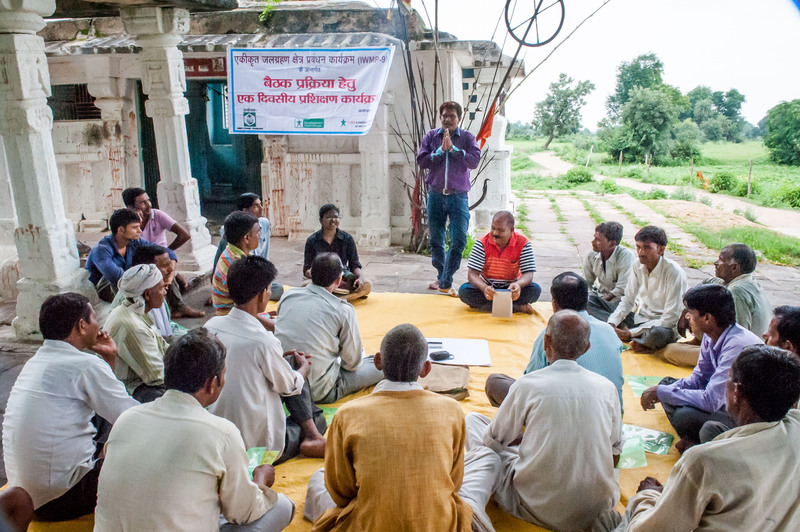 With a large part of our unfulfilled development aspirations lying in rural areas that are also more prone to climate risks, collaborative community models are essential to create an equitable cost-sharing mechanisms and economies of scale at the last mile, and also the best way ahead to achieve scalability needed to create buffer against climate risks. Looking at the case of agriculture, while PPP has emerged as the 21st century economic tool to fast track infrastructural development and leverage operational expertise through participatory management, there is a need to approach PPP in agriculture with the distinct value systems of Social Equity that are different from the extant ethical and operational paradigms in other sectors, owing the large mass of lower to middle income population involved. The proponents of Social Equity in Agriculture have to be centred on Collaborative Community Structures that can provide equitable administrative responsibilities; scalability from production to marketing, logistics and consumer engagement; and balance social benefits with jural requirements. The Indian financial sector is well abreast of the climate risks and banks and other financial institutions are already interweaving climate friendly instruments into their existing product portfolios. Financing for renewable energy has grown significantly during the past few years and the growth momentum is expected to continue in short to mid-term, mainstreaming more and more low-carbon portfolios. In February 2016, Yes Bank raised INR 1,000 crore via a 10-year bond, which was oversubscribed twice. A month later, the Exim Bank of India issued a 5-year $500 million green bond – India’s first dollar-denominated green bond which was subscribed nearly 3.2 times. With the new government’s thrust on climate policy, climate finance is definitely growing in India. While one part of the push remains on mobilizing funds specified as ‘climate finance’ that are used for adaptation and mitigation, the more important part to ensuring success lies in creating a framework where mainstream financial actors are engaging on climate-specific activities, as a result of strong policy signals or economic opportunities in the sector (Jha, 2014). As the world’s largest democracy, India’s policy frameworks will define the development blueprint for a large part of the developing world. However, it is imperative that concepts like Payment for Ecosystem Services are ingrained into mainstream business plans with a focus to create ‘business sustainability’ rather than relying on stop-gap mechanisms like grants and subsidies that can prove counterproductive in the long run. Jha, V. (2014). The coordination of climate finance in India. London: Overseas Development Institute. Nallathiga, R. (2005). Institutional innovations of Urban Governance: Some examples of Indian cities . Urban India, 1-28. Rongdong Chen, M. Z. (2011). INSTITUTIONAL ENVIRONMENT AND INSTITUTIONAL INNOVATION IN SOCIAL ENTREPRENEURSHIP: EVIDENCE FROM. Frontiers of Entrepreneurship Research, 703. Ryan Raffaelli, M. A. (n.d.). INSTITUTIONAL INNOVATION: NOVEL, USEFUL, AND LEGITIMATE . OXFORD HANDBOOK OF CREATIVITY, INNOVATION, AND ENTREPRENEURSHIP: MULTILEVEL LINKAGES.